What's more important in education than reflection and goal-setting? 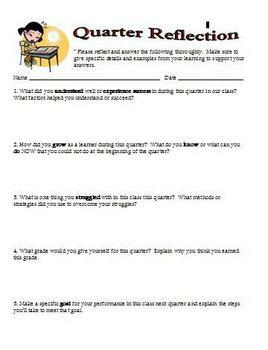 This document is a quarterly reflection guide that asks students to take time to evaluate their learning and performance in class. It guides them through reflecting on their grading period and then asks them to set goals for the next grading period. This guide can be used in any subject area, as the questions are broadly focused on learning, not specific content.